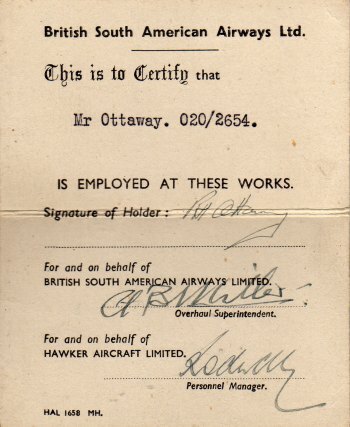 This image and the one below show the actual Langley aerodrome site pass issued to my father Reg Ottaway when he joined BSAA in 1947. 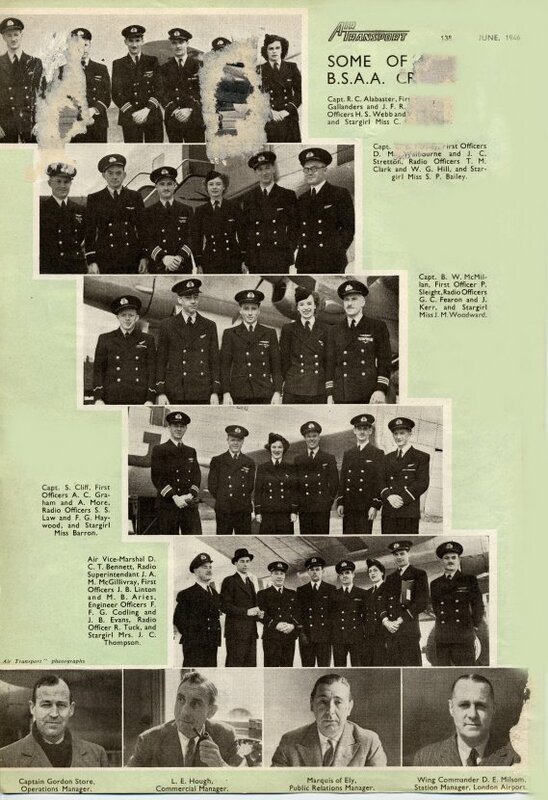 Images courtesy of Ann Davidson. 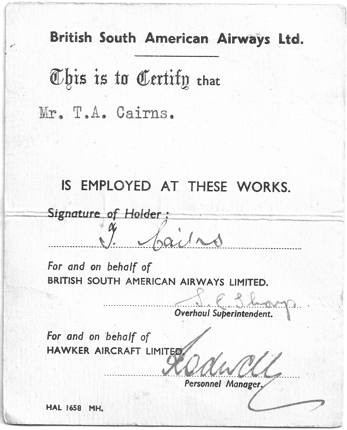 The scans below were kindly sent to me by Ian Cairns and are the BSAA and BA passes of his father Tommy Cairns. 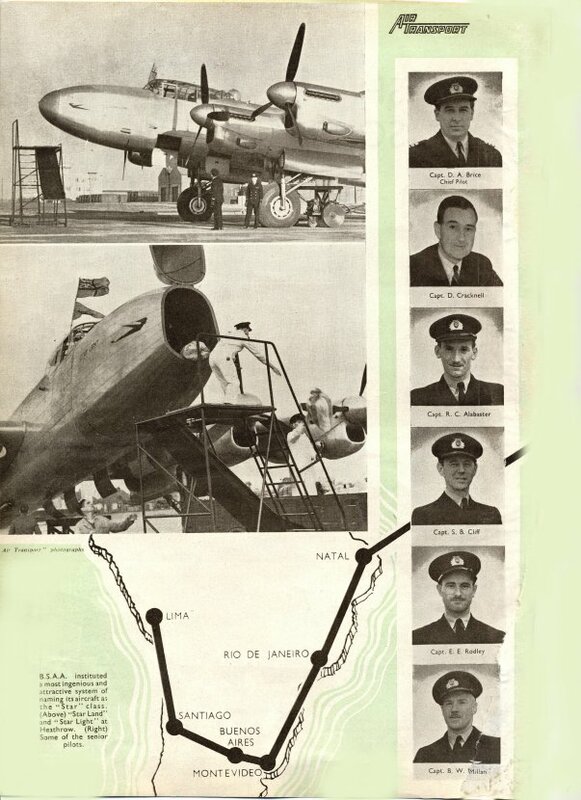 Notice that between Ian's father and my father joining BSAA at Langley the Overhaul Superintendent changed from Mr. Miller to Mr. Sharp but the Personnel Manager was the same. Thanks to Ian Cairns for these images. 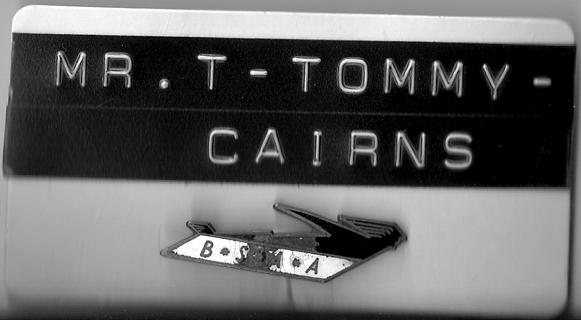 Nameplate and BSAA badge originally belonging to Tommy Cairns. Thanks again to Ian Cairns for the image. 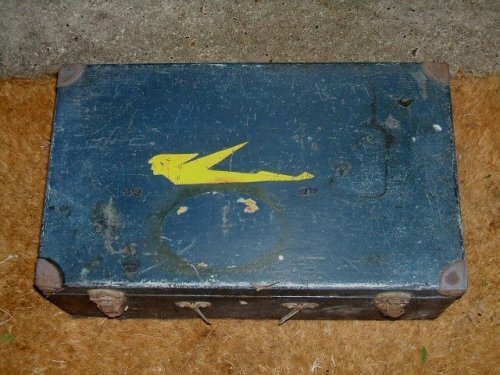 This tool box with the BSAA 'Speedman' logo was used by engineer Richard Enser at Langley aerodrome. 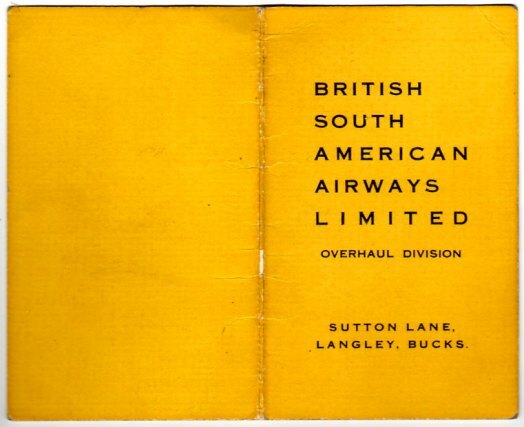 It still contains the full set of spanners he was asked to report with on his first day with BSAA at Langley in February 1948. 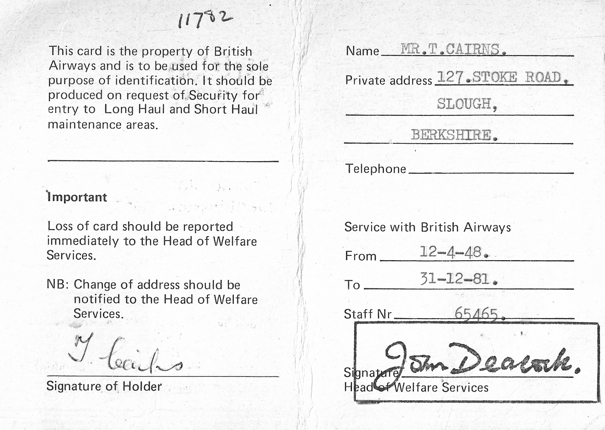 His starting pay was 1 shilling 1 and 1/8 pence per hour! 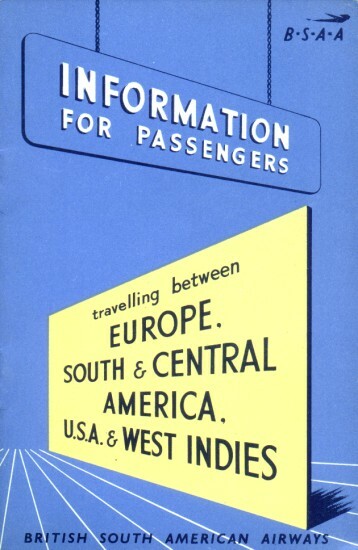 Image courtesy of Richard Enser. 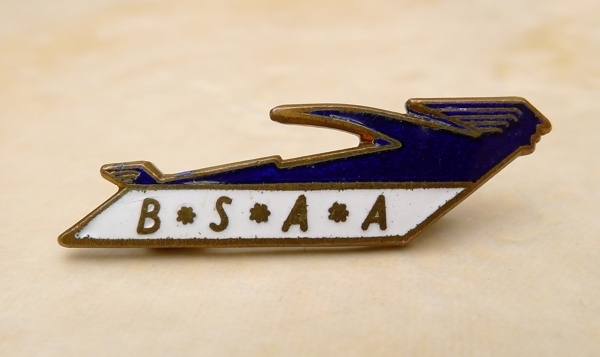 This badge was very kindly sent to me by Marian Bush, who believes it may have originally been owned by her grandfather, who travelled a lot after retiring from the Navy. Thank you Marian! 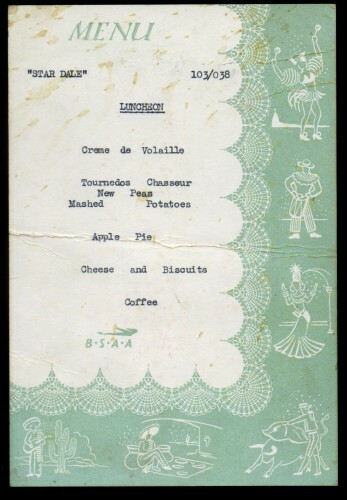 Menu from York flight 103/038. 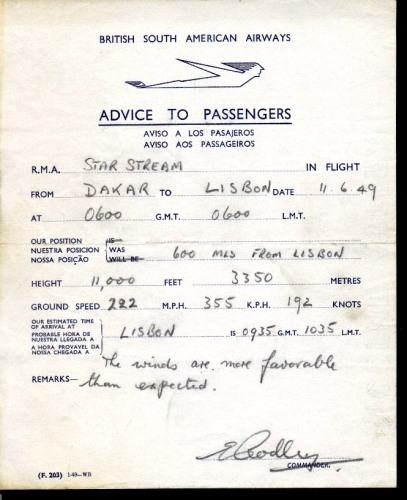 This is most likely to be from the London-Lisbon leg of the flight to Buenos Aires. 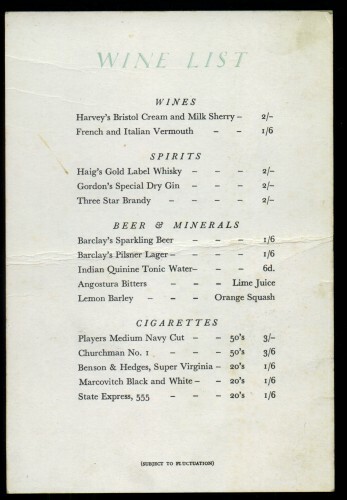 The list of drinks and cigarettes available from the menu above. 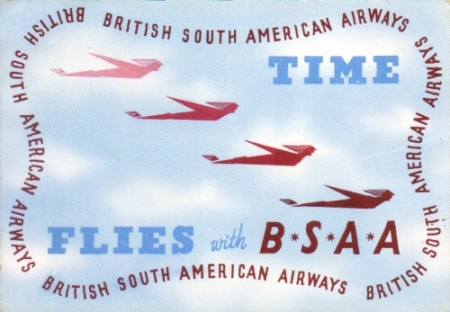 A blotter using another advertising slogan - "Time Flies with BSAA". 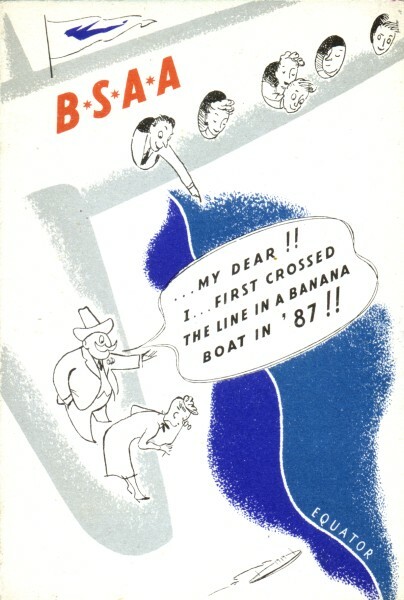 A blotter showing postcards of destinations served, and an artists impression of a BSAA Tudor IV. 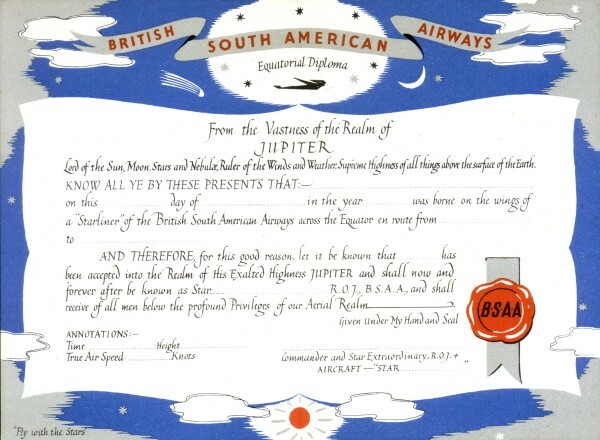 A beautiful and rather elaborate certificate issued to passengers as the aircraft crossed the Equator. With thanks to Wyn Fieldson. 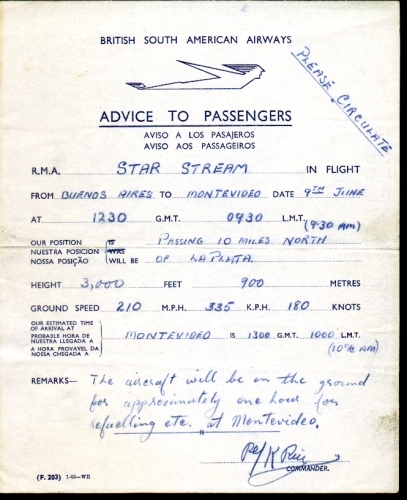 Ticket wallet issued to passengers in 1949. 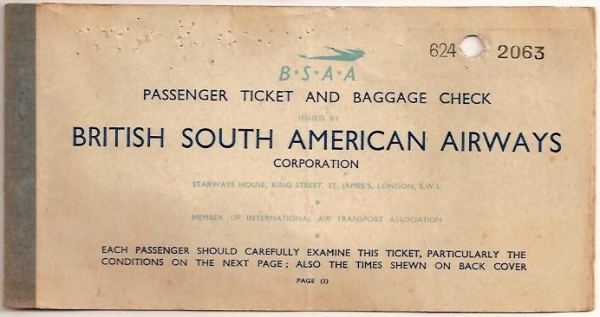 A typical BSAA passenger ticket. 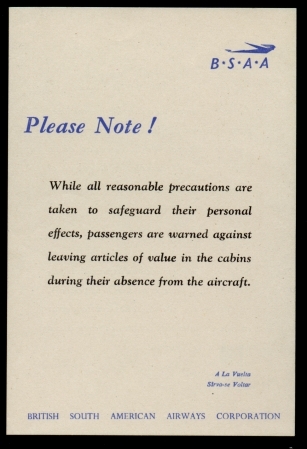 Notice the attempts to keep passengers entertained during those long flights. 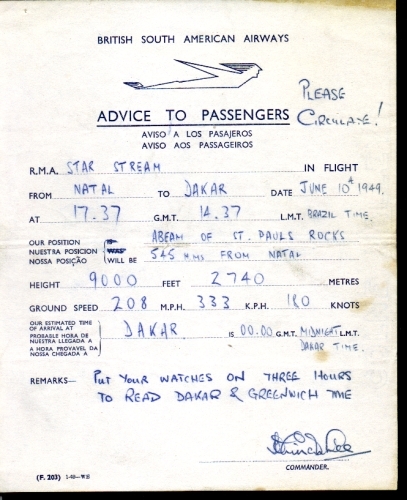 These documents were a standard feature of BSAA flights. 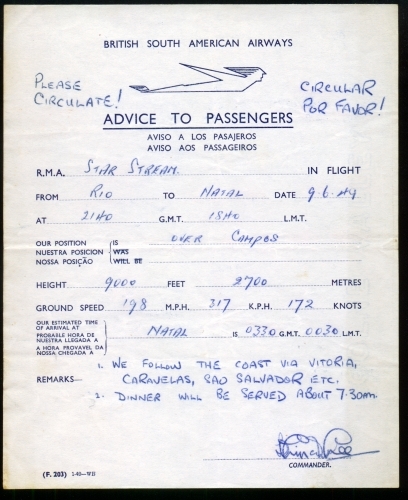 The forms were generally completed by the Captain or First Officer at intervals during the flight, to be passed among the passengers. 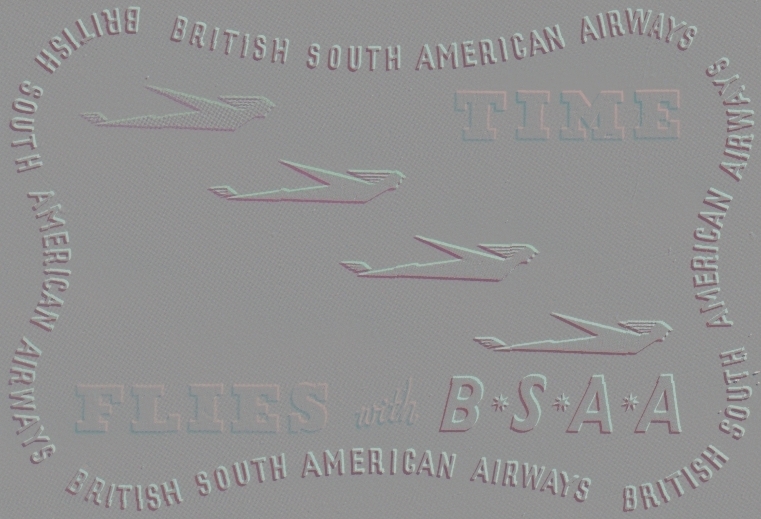 Another attempt to relieve the boredom of extremely long flights! 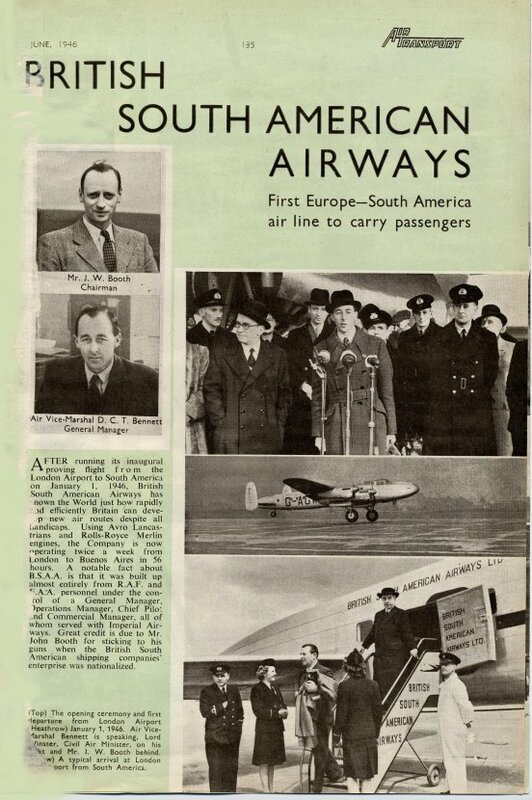 An interesting article about BSAA in the early days. 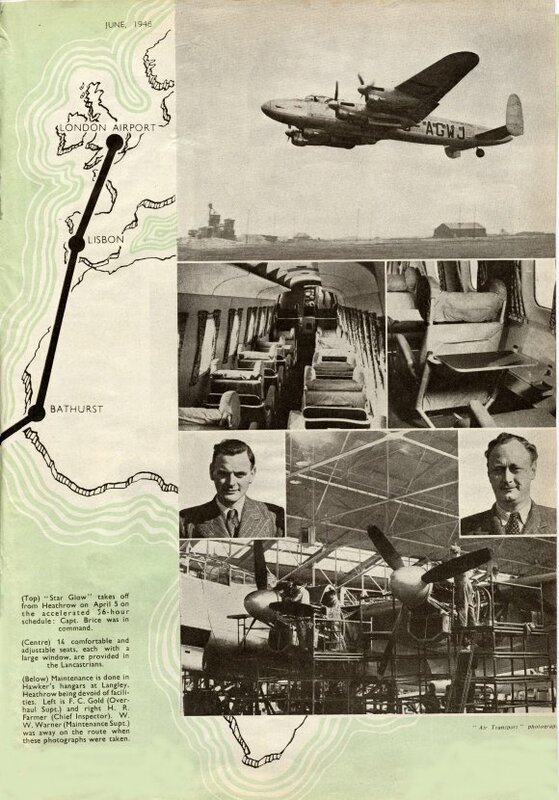 Notice the photo of Air Vice-Marshal Bennett making a speech to the assembled group at the opening of the new London Airport on January 1st 1946.